Today North Europe comes nearer to new standards of house-building. There are a lot of experimental projects which test “green” technologies widely. The “green” technologies market in Denmark and Sweden increases and accelerates a pace. These countries try to outrun German and Great Britain in the sphere of eco-building. Today we will get to know with the Danish settlement Stenlose-South – one of the most energy-efficient European settlement. 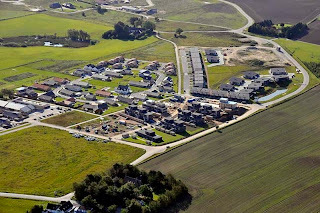 In 2004 Danish municipality Egedal bought a dale near of Copenhagen. This area was sold retail to the developers for low-rise building. The architecture of houses can be absolutely various, but it was only one experimental condition – all houses must be up to the ecological requirements. And now there are 750 cottages and townhouses on the area of 76 hectares. Stenlose is ecologically appropriate and economically sound. Firstly it is forbidden to use here faulty technologies and unhealthy materials (such as PVC, phenol). Secondly it is energy efficient place: all houses consume energy here on 35% less than it is stipulated by the Danish building code. From the outside all cottages seems simple and have just all necessary. There are no fences. But streets public spaces are too wide. Probably in Denmark it is not done to boast of your dwellings. Most of them have only one floor, because it will be too hard to live in two-storeyed house in old age. Windows don’t have curtains. It is considered that in the past neighbors could see what does sailor’s wife do when her husband went to the sea. Such are traditions. Such houses are interesting first of all by their engineering inside. Strong heat insulation system and energy-efficient windows keep warmth. Recuperators gather heat from air leaving the house. Especial thermocompressors get 3–4 kW of heat from 1 kW of electricity and hot water comes out of it. One more technology is the rainwater gathering system. This water is used for domesticity completely. For example, some houses have solar batteries. Other cottages are like thermoses: they have very strong heat insulation systems and high-powered recuperators. As result they needn’t individual heating. There are also social townhouses for people with a small wealth. But Russians will be shocked by prices here: 1700 euros for square meter. Beginners who risked to buy the energy-efficient house here now only hope not to miscalculate. The building of such cottage is more expensive than the building of the usual one in 7–10%. But costs must be repaid in 15–20 years. And if to take into account the growth of prices for energy resources, Stenlose has great perspectives. Sure that Stenlose is an experiment. And it also has some disadvantages. Most of them are connected with building mistakes. Take for example a local kindergarten. There was a big glassy atrium right above the warm floors. All warmth just left rooms though the ceiling. Later it was covered by big piece of cloth. Here is other example: a lot of houses have wide windows and don’t have lobbies to defend rooms of wind and cold. Research of the optimal decisions continues now. Generally an experimentation spirit hovers in Denmark. There are a lot of trial projects with houses-thermoses or eco-settlements where people use only natural material and live just by farming. Some projects test renewable energy. i do not have any idea to energy and ecology.but natural resources energy is very important.